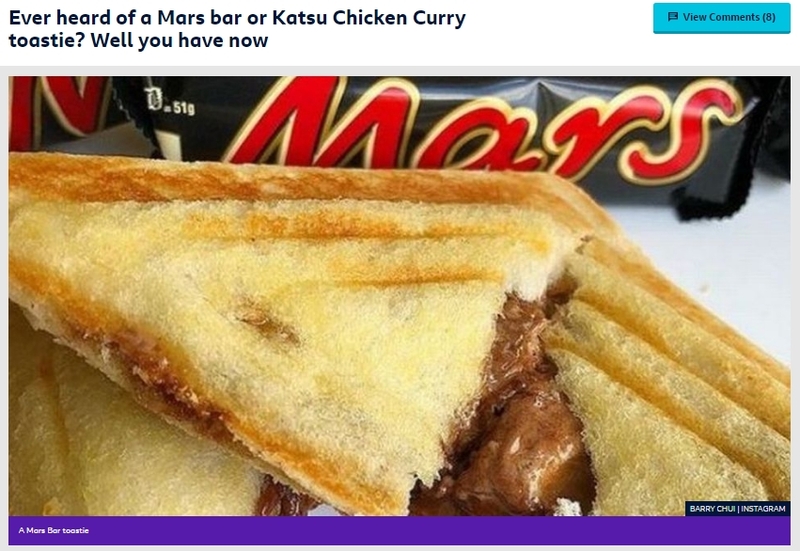 Ever heard of a Mars bar or Katsu Chicken Curry toastie? If you head out for a bite to eat but are a bit disappointed by the same old fare then the story that Steve mentioned on tonight’s show might be welcome news. Or, perhaps you have a few weird food fetishes yourself that you would like to see going mainstream in a high street chain? That’s the just what one “Restaurateur”, Barry Chui, is doing in Manchester with his plan to open an outlet based on some exotic variations of the humble “Toastie” including Japanese Katsu Chicken Curry, molten Mars Bars, Caramac and even Super Noodles. So, as Steve was asking on the show, we’d love to know what foods you’d like to see go global with it’s own chain of outlets? Perhaps there’s a new market for variations on the everyday, Jam Sandwich or is it weird food combinations that need to go mainstream such as chilli ice-cream or sausages with custard? Let us know via our Facebook and Twitter pages or emailing steve@accessradio.biz. You can read about all these stories on the BBC website by clicking on the image and links below.